The Morris Commercial was one of the first vehicles manufactured for civilian use after the War in 1947 and was originally supplied to a department store in Hull for local deliveries. It remained with the store in full daily service until it was sold in 1959 and it was then converted into a mobile fish and chip shop which served the Washington (Newcastle) area. In 1978 the vehicle was found abandoned in a field and it was purchased, restored fully and made roadworthy. It was used by Michael Gerson Limited for deliveries to special addresses including Downing Street, Buckingham Palace, Windsor Castle, Tower of London, Canterbury Cathedral, Queen’s Gallery and other similar prestige addresses too numerous to detail. In 1994 at the inauguration of the Channel Tunnel by the Queen and President Mitterand a cavalcade of 100 vehicles representing the years 1894 to 1994, 50% from France and 50% from England, travelled from London (RAC Club) to Paris (Place de la Concorde) via the newly opened tunnel – consisting mainly of cars and some motorcycles, there were just two commercial vehicles each belonging to a liveryman of the Worshipful Company of Carmen. LPT 880 was one of those two commercial vehicles. It has visited 10 Downing Street regularly bringing gifts from overseas dignitaries as well as undertaking moves for various Prime Ministers. It is also credited with delivering the first bomb-proof curtains following IRA activities. It is now no longer possible for commercial vehicles to enter Downing Street as security measures have been altered and goods or supplies can only be delivered through the Horse Guards Parade back entrance, so effectively it is probably the last commercial vehicle to have been seen in Downing Street. 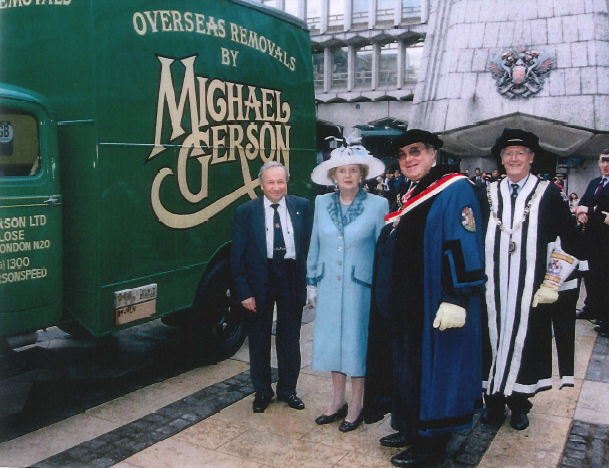 It continues to participate in historic and special occasions – In July 2009 it participated in the 800th Anniversary of London Bridge and last year it was marked for the first time by a lady Lord Mayor. If you know someone who is currently restoring or involved in the preservation of a removal lorry we’d love to hear from you. Maybe you too could see an article about your treasured possession reach thousands of readers.